4 Bright Yellow Candles of Height - 5 cm , 7 cm , 9 cm and 11 cm each. 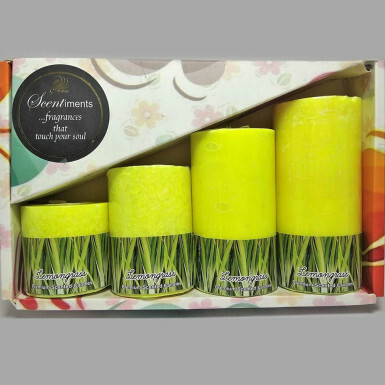 Bright as sun and fragrant as lemon grass, these beautiful candles are a delightful gift for anyone on any occasion. These candles make a wonderful gift on Diwali, Christmas, Anniversary, House warming ceremony or Reception or Marriage party. A gift so full of life and energy. They care a cheerful aura around them. A fragrance that fills you senses with pleasure and delight. Gift these candles to someone whom you really admire and care for. Convey your warm feelings with these cheerful and bright candles this festive season.